She is the whisper on the playground. When kids draw the monster that lurks under their bed, Mandy the monster hunter will be there. 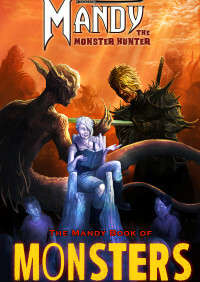 Mandy the Monster Hunter returns in this brand new anthology of fantasy and horror suitable for readers old and young alike. Featuring a combination of vibrant colour and atmospheric black and white, some of the best Hellbound Media artists bring Mandy’s world to life. Written by Mark Adams and Matt Warner. Art by Anna Susanne, Atlantisvampir, Luca Cicchitti, Jesse Thomas, Gordon Napier, Neil McClements, Oda Sonju, Capucine Drapala.